The 2018 Used Car Week event in Scottsdale, Arizona focused on the growth of business and ways to keep that momentum going in the future. One of the biggest topics of the event focused on ways dealerships can adapt and change in order to remain engaged with the community, competitive in business and ultimately remain successful no matter what the future brings. The event was split into two blocks as a way of giving real focus to the issues affecting the used car industry. Pre-Owned Con – Focusing on the challenges surrounding used car dealerships. Examining ways service centers, finance, sales and the front office can work more cohesively to create a smooth and enjoyable experience for customers. Auto Fin Con – Digging into how finance issues, trends and tools to improve the health and security of a dealership. From fintech strategies to traditional investments, industry experts dished on how to make the most of a finance department or company. Repo Con – Repossessions are an important part of many companies and ensuring these processes are safe and compliant has become increasingly important. The information and tips easily benefit both dealerships with their own repossession and recovery department or those looking to foster a better understanding and relationship with their company of choice. The National Remarketing Conference/NAAA Convention wrapped the week up, running from November 13th through the 16th. The big event covered reviews of information, news and trends affecting dealers of every shape and size. This year they also gave a lot of time to looking ahead. While it wasn’t an official theme, big data and online integration was a common thread running through many panels, discussions and presentations. From the all encompassing look at ‘Wholesale Evolution — The Transition from Brick and Mortar to Digital’ in the automotive world to handling the delicate details in ‘Harness the Big Data Revolution Amongst New Regulations’, there was something for everyone when it came to 21st Century strategies. Clearly, the future is one that embraces digital options and understands the importance of investing in multiple streams of service, marketing and communication for any dealership looking to prosper. In fact, one presentation focused on exactly that. In the event ‘Dealer Success in a Digital World: How to Win Connected Customers’ Georg Bauer, founder of tech company Fair, tackled the very real challenge of how dealerships have had to change rather suddenly. After all, while other businesses have been virtually reinvented with the advent of connected, online shopping, auto sales have held onto the same traditional methods and processes for decades. The event gave dealerships from every phase of the digital process a chance to see why the work they’ve put in is important – and what they need to do in order to remain competitive and engaged. This event offered real-world and timely tips on how to connect with users now as well as a glimpse into a future of a “flexible, all-on-your-phone transaction” that mirrors what users are already used to for everything from buying groceries to ordering their next big screen TV. 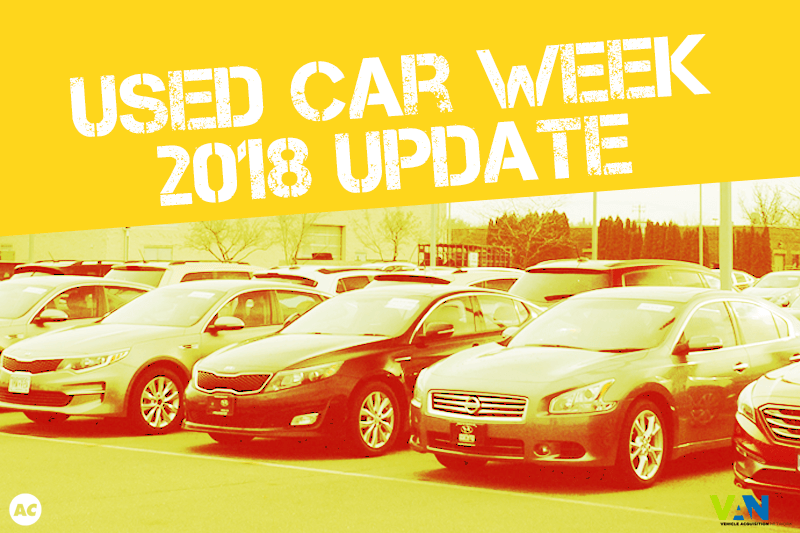 From the best first steps to take in order to connect online to the minutiae of navigating regulations on data gathering, this year’s Used Car Week proves that adaptability will be the driving force in the future. Stacey Jones is our reporter on the beat, seeking out the industry’s best news, current events, trends, and activities for Vehicle Acquisition Network. Got a story to share? Contact us to let us know. Thanks.